Over 100,000 copies sold. You can see why. Well the manual is paper back and just short of A4 in height. It contains 176 pages with some photos and they are all in black and white. The paper is a not bad quality but a little thin nothing less than I would expect to be honest. 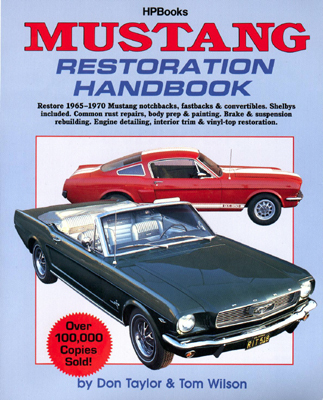 There are 12 chapters in all, 1 History & Identification, 2 Buying a used Mustang, 3 Disassembly, 4 Suspension, 5 Steering, 6 Brakes, 7 Engine & Engine Compartment, 8 Body & Paint, 9 Assembly, 10 Interior and Upholstery, 11 Instrument Panel, 12 convertible Top and Vinyl Top. Followed by the Appendix, Suppliers List, Metric Conversion Chart and Index. I prefer the pictures in this manual over the Haynes manual as they are clearer, bigger and the notes underneath explain what is going on well. The pictures in the book are sometimes complimented by exploded diagrams of some critical parts with their corresponding part numbers. I thought that was a nice touch. In my opinion this book is based at a more all round the car manual. With so many different models and variations of Mustang from this era, there is a general picture for the section required that may not be the actual model and spec you want, so there could be some differences in pictures. But, they do try to mix it up a bit and to be honest you don’t really notice it that much. Where there are differences that need explaining or a different procedure the manual does go on to make that differentiation, so I can’t fault the manual for that. I prefered this manual over the Haynes manual when I had to strip down my seized up brake servo. I shall certainly use it again for the brake drum rebuild when I get to that point. Each of the sections is well thought out and gives a logical progression through the pages. The manual does seem to be aimed at repairing what you have rather than just a straight replacement of parts. This is quite evident in the bodywork section. There are some real nice tricks in some of the sections, such as how to paint the speedo dial without making a mess and the painting of rear light clusters etc. Downside? I just wish there was more of it if that makes sense. I just want them to get into all the all the bits and pieces in colour. The wiring section is a little limited but covers the basics where it is and what it does. However it does recommend a few options if you need to go down the re-wire route. A must have purchase for around £15 – £20 so it’s not stupid priced. This is my choice for being able to see what you are doing rather than reading it which for me is the way to go. To glance at an exploded diagram to see what goes where is easier than reading about it. One of my favourite reference books.